What wine should you drink for Thanksgiving? A legendary knight slaying a dragon might seem like a fearsome image for your Thanksgiving table. So the producers of a 2014 Birichino “Saint Georges” Central Coast Pinot Noir are quick to talk about the art on the label. Winemakers Alex Krause and John Locke explain that they avoid making “fire-breathing pinots” — highly extracted, big-with-alcohol bottles easily found in the Golden State. Rather, the duo aims for a style that is lithe and buoyant, crafted from fruit cultivated at the southern edge of the Santa Cruz Mountains. This unfiltered red, fermented by ambient yeast, offers ripe varietal character with all of the good stuff left in — a natural with roast turkey and all the trimmings. Also well suited to the big feast is a 2014 St. Innocent “Freedom Hill Vineyard” Chardonnay, a barrel-fermented pour made from grapes grown southwest of Salem, Ore. Veteran winemaker Mark Vlossak says that the winery gets its name from his father, John Innocent Vlossak. This lovely white, also crafted with indigenous yeast, undergoes malolactic fermentation to achieve suave acidity, and is aged on the lees to promote textural richness. It’s a beautifully balanced style of chardonnay, perfect with traditional buttery dishes. Count on these saintly pours to foster good will around your holiday table. 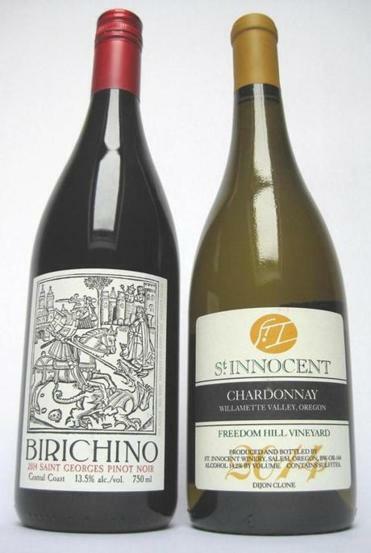 Birichino “Saint Georges” Pinot Noir 2014 Bing cherry, sweet beets, and blue flowers greet the nose, leading to a palate of ripe fruit and mineral, with a whisper of white pepper on the finish. Around $28. At Urban Grape, South End, 857-250-2509; Streetcar Wine & Beer, Jamaica Plain, 617-522-6416. St. Innocent “Freedom Hill Vineyard” Chardonnay 2014 Aromas of stone fruit and a whiff of dried pineapple combine with light oak spiciness. Offers appetizing body and poise in the glass. Around $26. At Whole Foods River Street, Cambridge, 617-876-6990; Wollaston Wine & Spirits, Wollaston, 617-479-4433.